Copyright 2014 WGBH Radio. To see more, visit http://www.wgbhnews.org. 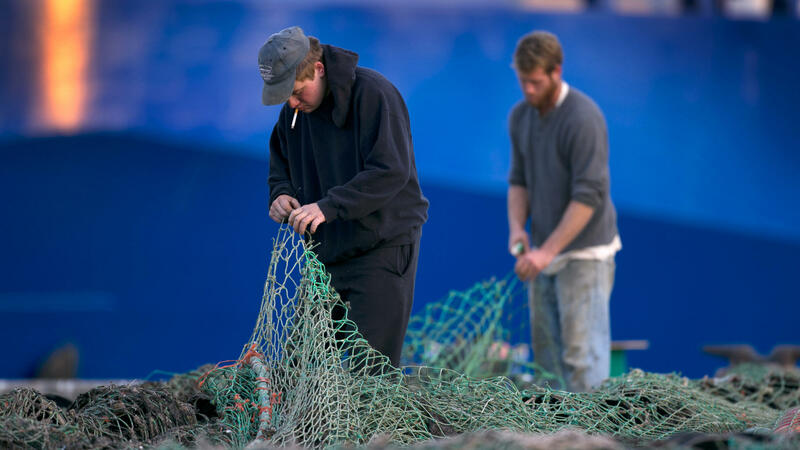 Cod fishermen in the Gulf of Maine will have to stop fishing for the next six months. The emergency ruling covers the vast area from the tip of Cape Cod to the Canadian border. Despite decades of regulation, regulators say cod stocks have plummeted, and restrictions are needed to protect the resort. Anne Mostue has this report. ANNE MOSTUE, BYLINE: It's a sunny morning on the harbor in Gloucester, Massachusetts, just north of Boston. The stench of rotten fish and seawater are overpowering. Joseph Orlando and a friend are repairing a large blue vessel, the Lady Jane. They had been looking forward to fishing heavily for cod for the next two months. JOSEPH ORLANDO: Well, we do it all year long. But most of the cod, we save for around Christmas time, because there's a lot of call for it, because of the holidays and stuff. And fishing's pretty good and prices are better. MOSTUE: Orlando uses one big green net to trawl for cod, haddock and flounder. He may target one species, but he catches some of each. If he can't catch cod, he can't go after the rest. ORLANDO: So we're done. I mean, this is it. And this is uncalled for. There's more codfish out there - there's always been. I mean their science is just absurd. MOSTUE: The science he's referring to is data from the National Oceanic and Atmospheric Administration, or NOAA. They say haddock numbers are up, but cod are down. Michael Ruccio is an analyst with NOAA, and says cod are at 3 to 4 percent of levels necessary for the population to be sustained. MICHAEL RUCCIO: For cod to make a meaningful recovery, it's important to begin to protect their spawning activities, as well as where they aggregate and are found in large concentrations. MOSTUE: The federal rules expand areas where cod fishing was already banned, and accidental catches of cod are limited to 200 lbs per boat. But the Gulf of Maine is vast, and cod populations vary widely. JAMES WILSON: I live in Down East Maine. There are no codfish in Down East Maine. There are a lot of codfish around Gloucester. MOSTUE: James Wilson is a professor of marine science and economics at the University of Maine. WILSON: When the feds report that on average there are no codfish or very few, they're correct. When the fishermen in Gloucester report they see a lot of codfish, they're correct. The problem is trying to manage the system as if it was a single system when, in fact, it is a system that has many different parts. MOSTUE: Wilson and the fisherman cite varying depths and water temperatures - some of which are related to climate change. So, as NOAA implements immediate short-term management measures for the entire Gulf of Maine, some fishermen fear they will become permanent. There's a lot of debate over how the federal government is counting the fish and where. In the meantime, fisherman Joseph Orlando is concerned about imported cod taking over the market. ORLANDO: We use the biggest mesh size in the world. We have more regulations than anybody else in the world. But, yet, we get pounded the most. And we import from countries that have no regulations. That's an outrage. MOSTUE: The ban on cod fishing is for the current season, and will be effective until May. But biologists, fishermen and regulators have been monitoring cod stocks for 40 years and frequently changing rules. This most recent ban is the most drastic ever for cod. For NPR News, I'm Anne Mostue. Transcript provided by NPR, Copyright NPR.